These are very similar to the fried apples you can get at Cracker Barrel. I found the recipe here and made some adjustments. I think the ones at Cracker Barrel simply have cinnamon in them (and maybe even butter? ), but I'm not completely sure. These are great as a side, over pancakes or waffles, or as a dessert with a scoop of vanilla ice cream. A fantastic fall comfort food for sure. Do be patient as you heat them. It says to simmer gently, which helps prevent the apples from falling apart. I got impatient and turned my heat up too high and they started to boil and break apart. Once the cider heats up, the apples will cook fairly quickly. I have lots of broken apples in mine and at first I was devastated but then I remembered the ones at Cracker Barrel are often broken, too. So it's okay! Combine apple slices and 2 cups cider in a large skillet over medium heat. Simmer gently, constantly turning apples until fork tender but not mushy. 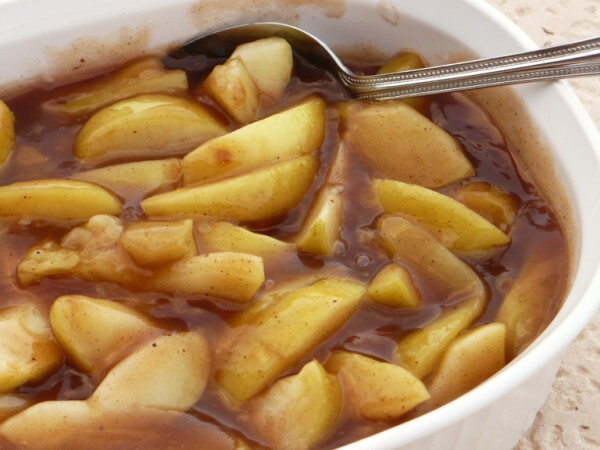 Remove apples with a slotted spoon and put in oven-safe dish. In a blender, combine 1/2 cup cider, cornstarch, spice*, and sugar. Blend until smooth. Whisk into hot cider in skillet and increase heat to med-high. Whisk and cook until thickened and bubbly; pour over apples and serve warm. Go light on the ginger and cloves since they are pretty strong. Or you can always just use a teaspoon of cinnamon. Still yummy!